Blood Stone Shard - / 99 - / 600 +0 +3 Embed in weapon to fortify. Blood Stone Shards are used in fortifying your weapon up to +3, so they're one of the most important items you should aim to acquire in the early stages of the game. 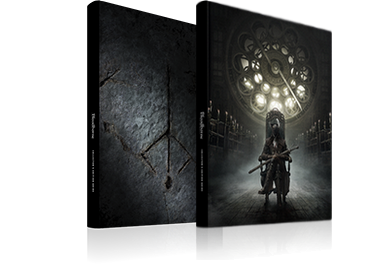 Some areas such as the Cathedral Ward have an abundance of them that you can pick up, with the Yharnam Path area being especially lucrative. Some enemies, such as the Large Huntsmen and Scourge Beasts in Central Yharnam, also have a chance to drop these items when killed, as do bosses in level 1 Chalice Dungeons. If you're looking to stock up on some of this item early in the game, you may want to spend some time hunting those enemies. 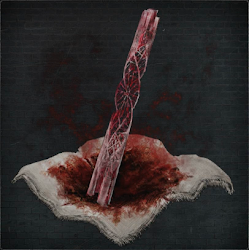 Acquiring the Radiant Sword Hunter Badge will unlock them for purchase from the Bath Messengers for 2000 Blood Echoes, and once you advance time to night you'll also be able to purchase them from the Insight Trade for 1 Insight. Once you've unlocked them in the shops, it's worth using your Insight points to get them, so that you can conserve Blood Echoes for other things. If you find a weapon you want to use, it's worth using three Blood Stone Shards on it as soon as possible, because doing so unlocks a Blood Gem slot. With the addition of Blood Gems your weapon can gain incredible attack power boosts, so these first few upgrades using basic Blood Stone Shards are actually the most important of all.